Lauren Kogod is partner at Kogod Smiley Architects. She earned a B.F.A. and B.Arch at Rhode Island School of Design, an M.S. in Architecture and Building Design at Columbia University, and is a PhD candidate in Architectural History and Theory at Harvard University. Prior to Cooper Union Kogod was Lecturer in Architectural History and Theory at Yale University School of Architecture. 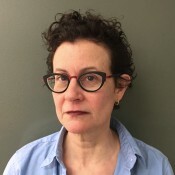 Her articles and essays have been published in Assemblage, Harvard Design Magazine, Architecture + Urbanism, Adrian Luchini (CWA), Enric Miralles (AD Monograph) and Architecture and Capitalism, 1850 to the Present (Routledge). View Lauren Kogod's CV here.